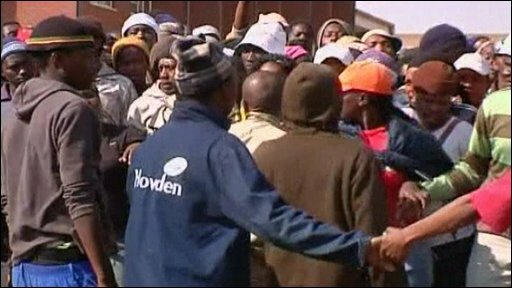 Violence in South Africa's townships has spread as residents protest about what they say is a lack of basic services, such as water and housing. Police have fired rubber bullets at demonstrators in Johannesburg, the Western Cape and the north-eastern region of Mpumalanga. In Mpumalanga, there were reports of foreign-owned businesses being looted as foreigners sought police protection. More than 100 people have been arrested during the past week. The rising tensions in the townships have revived memories of xenophobic attacks on foreigners last year in which more than 60 people died. What we are seeing is a combination of a series of different factors. South Africa is in the grip of its first recession for 20 years. People in the townships, the poorest people in South Africa, complain that after 15 years of ANC rule they still don't have basic housing, electricity or water. Jacob Zuma put service delivery at the heart of his election campaign and that's in part why he won a big mandate. But a lot of people look at the local level ANC and say they need to start delivering, and they will be looking to Mr Zuma to root out the corruption and nepotism which have prevented service delivery being expanded throughout South Africa. The latest protests over service delivery come less than 100 days after Jacob Zuma took office as president, following a resounding election victory for the governing African National Congress (ANC). They are a reminder of the impatience felt in the most deprived areas of the country, says BBC world affairs correspondent Peter Biles. On Tuesday, police cars were stoned in Thokoza near Johannesburg during a demonstration about living conditions that turned violent. Nearby township Diepsloot saw cars and houses being burnt last week in protest at plans to tear down makeshift shacks to make way for a sewage pipe. President Jacob Zuma promised to improve service delivery when he came to power in May, and said fighting poverty was his priority, highlighting the huge economic and social challenges facing South Africa. However, South Africa announced in June that it was facing its worst recession in 17 years. Fifteen years after the ANC won its first election, more than one million South Africans still live in shacks, many without access to electricity or running water. The gap between rich and poor is also wider than it was 15 years ago, our correspondent says. The slow provision of replacement housing has long been controversial - nearly three million have been built, but the allocation has been prone to nepotism and corruption. In addition, the global economic climate has banished any hope of South Africa maintaining record levels of economic growth, and reducing unemployment. In the midst of this latest unrest, Mr Zuma is embarking upon a tour of the country to thank voters for returning the ANC to power in the elections last April. Our correspondent says he will now be under even greater pressure to explain how the ANC is going to meet its plethora of election promises.